Below is a note from Jim Trickett regarding our Individual Landowners’ Observation data. Also attached is the required Landowner Individual August Census form…….or you can use Jim’s shortened version attached above. “The Observation data is needed to finish the survey. It needs to be turned in as soon as possible [Sept. 1st]. The survey sheets you have should be tallied and that data passed along to me. The sheets can be placed in my mailbox – 1278 Oakridge Road – the green address sign is close to the mailbox, but not on it. If you would prefer, I will accept the data you have added up and averaged at bottom of the sheet. Below is a form you can fill in the data and email by return email to jtrickett@att.net. So either bring the sheets to my mailbox or send back the summarized data sheet below [via email]. The Court ordered burn ban (see below) was lifted for Colorado County on August 30, 2017. OVFD will still prefer you ask for assistance and back-up when burning your brush piles. You are required to call in your brush burning to the administrative line for Colorado County Sheriff’s Office before you burn. Be careful out there! There is still loads of dry grasses & leaves falling from the trees that are totally dry. The Colorado County Commissioners’ Office has reinstated the Burn Ban for Colorado County effective Aug 14th and for the next 90 days. The burn ban includes “the use of combustible materials in an outdoor setting.” This includes but is not limited to trash burning, burning of brush piles and open campfires. Please see the attached Burn Ban order for complete details. As always, you can check the Current Burn Ban Map under the Fire Danger tab on this website. This map is updated daily. Attached is the individual landowner’s deer census form for August 2017 for your immediate use should you not have received it before this post. 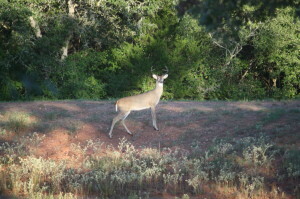 All Oakridge Ranch property owners are required to complete this form and submit it as part of the Texas Parks & Wildlife Department Managed Land for Deer (MLD) program for the Ranch. These are sent to our county Wildlife Biologists to use for management of our deer herd for the upcoming season. Please submit your completed form to Jim Trickett at the address at the bottom of the attached form by Sept 1st. We appreciate your cooperation and participation in your MLD! 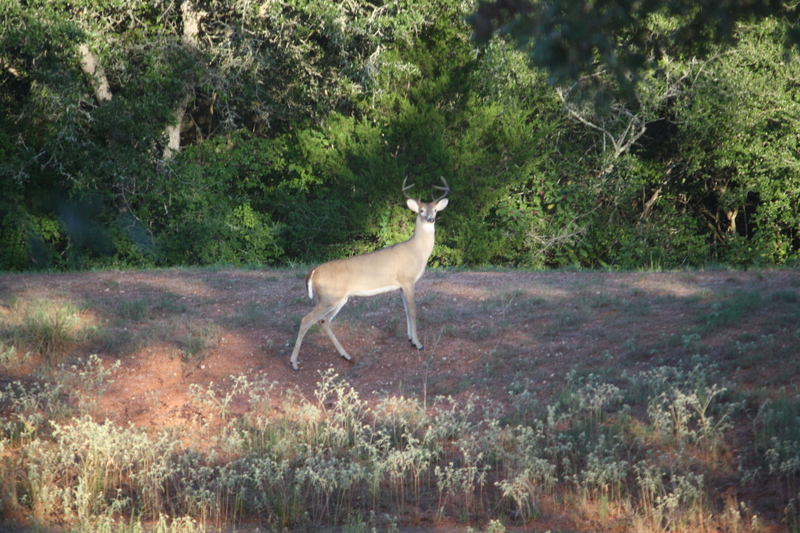 Young Buck; Photo by B.LaVergne, 09-2013. 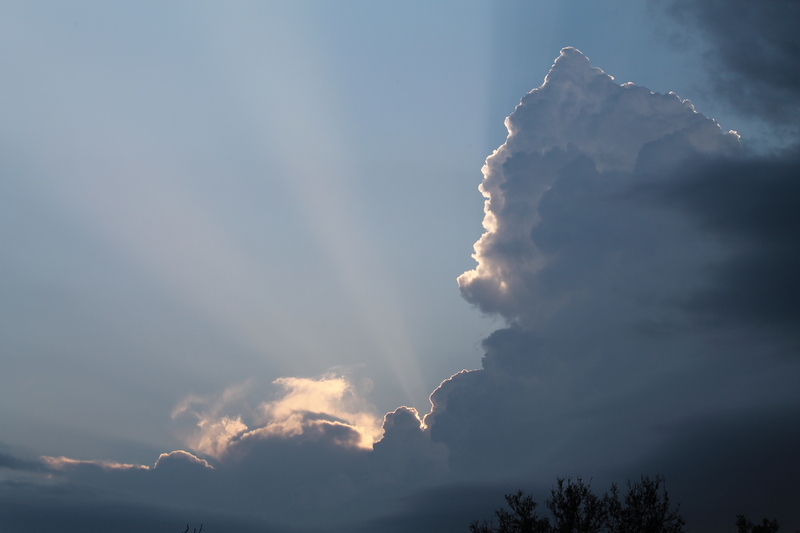 Click on the picture above to enlarge. Enjoy! Attached is the August 2017 AgriLife Extenstion Service Newsletter from our Colorado County Agent, Stephen Janak. The Greater Roadrunner (Geococcyx californianus) is native to the desert southwest portion of the U.S., also found in most states of the southwest. 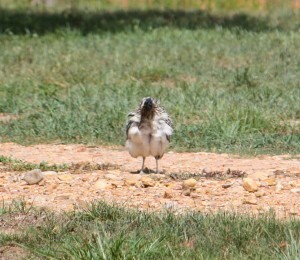 These birds are year-round natives of Texas, including the Oak Prairie Region here at Oakridge Ranch. Several birds have been seen for the last few years in our area and we have had a nesting pair for the last 4 years. These birds are much more interesting than the one made famous in the Warner Brothers cartoon series. Adult birds are 20-24 inches long with a large up-turned tail and long beak and mottled black/brown & white feathering throughout its body that appears to look like stripes. These birds have long legs with 4 toes on each foot, two pointing forward & two pointing back. You’ll rarely see a Roadrunner in flight for more than a few feet because it can’t get the lift it needs due to its size. 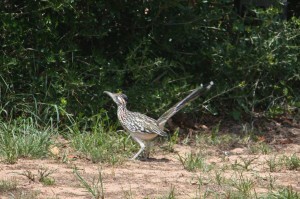 However, Roadrunners have been clocked at 12 to 17 miles per hour. 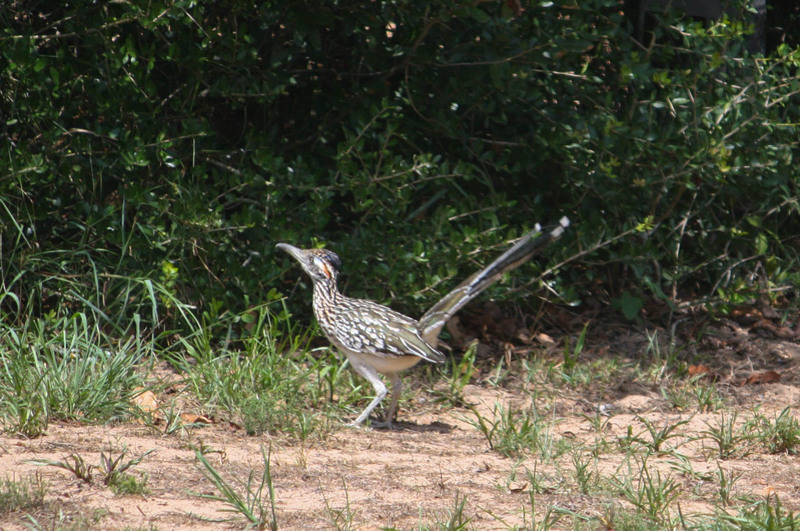 Roadrunners mate for life and have 2 or 3 clutches per year as habitat conditions and food availability allow. A hen will usually lay 2 to 12 eggs in one clutch, but records show up to 20 eggs have been laid in rare clutches. Their nest is built by the female 2 to 12 feet off the ground with materials supplied by both the male and female. Interesting thing is the male sits on the nest at night since the female’s body temperature drops too low to keep the eggs warm enough. Young birds hatch out at about 20 days and are taken care of by both parents. 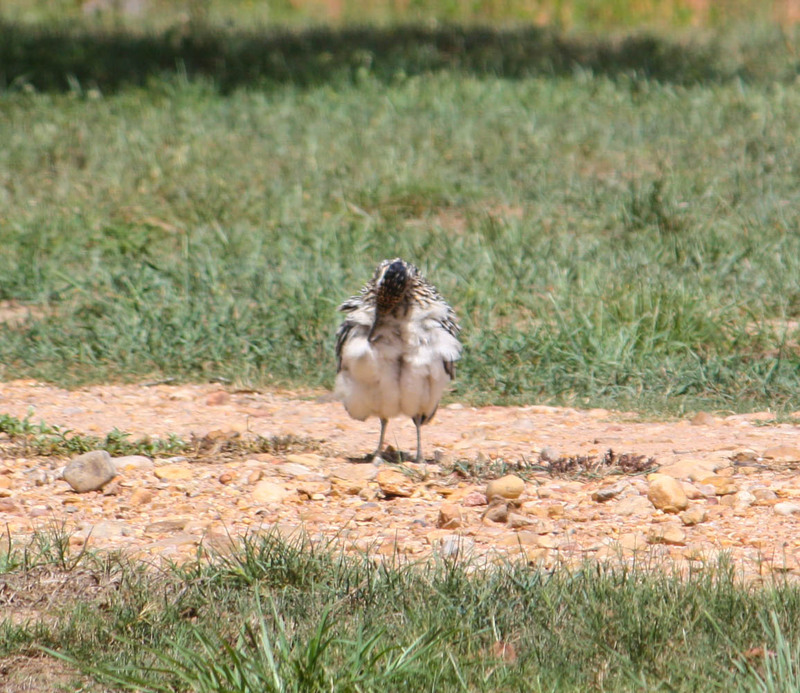 The baby Roadrunners will leave the nest at 18 to 21 days, but will continue to be fed & cared for by the parents until day 30 to 40 when they go out on their own. 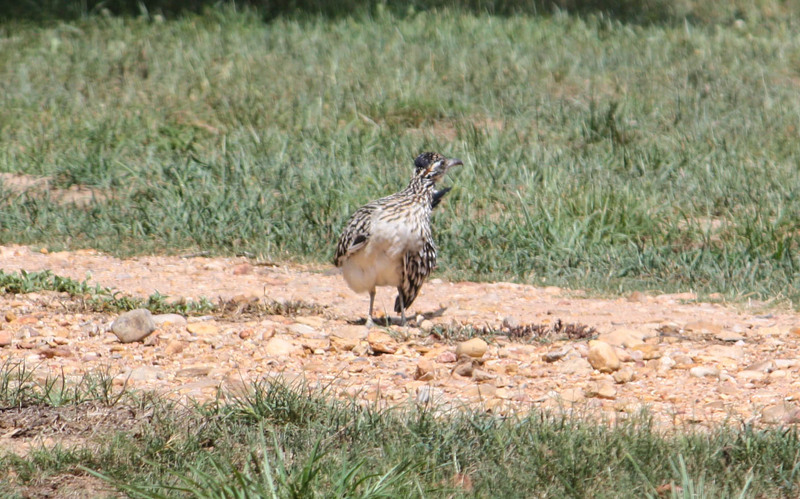 Greater Roadrunners’ life span is approximately 8 years. Greater Roadrunners are omnivores. Their diet is varied and includes insects, various plants & berries, lizards, small birds such as sparrows & hummingbirds. And they are fast enough to take on rattlesnakes for dinner! These beautiful birds do drop their activities by approximately 50% during the heat of the day. Stay alert when you’re on the roads in and around Oakridge and you just might catch a glimpse of the amazing birds. Click on any picture here to enlarge it!